Laying there in the camper, I was wondering what time it was. I had fished late the night before and knowing that it was supposed to be at or below freezing I had thoughts of just staying put. Nah…you don’t catch fish from your bed; I jumped up, it was a few minutes before 6 and that would give me enough time to drive the few miles to the lake, get all my gear together in the dark…and be on the water ahead of daylight. As I stepped out of the Yukon I spotted the moon and knew something wasn’t right. Then it hit me, there was supposed to be an upcoming lunar event and this had to be it. I love to stargaze, but had forgotten about the lunar eclipse…looks like there was at least one reason I arose this morning and didn’t just roll over? If you have ever float-tubed…it takes some time to get things ready. Add fly fishing to the list and you have even more things to think about. I shoved off backwards into the water, leaned forward and put on both kick-fins, flipped around and there in front of me was the moon. It was hanging over the lake. The eclipse was now about half; the reflection of the moon was now right there in front of me in the dead calm water. I reached behind me, grabbed my 6-weight rod strung with Rio sink-tip, type 1 fly line and took a quick look at my yellow streamer. All was good, I put the lake edge to my left, stripped out about 50 foot of line and carefully made my first cast towards the perimeter. I say carefully because I didn’t want to snag a limb and have to tie on another fly in the darkness…truth is it was getting darker by the minute as the eclipse waned. I had gone about a hundred feet when I heard a pair of geese open up far up over the hill, when they did they fired up a Tom Turkey and the morning was officially on! The geese continued to honk back and forth and before I knew it they were heading directly towards me…even in the darkness I was close enough to see the pair land, feet down, head up and water splashing ahead of them. It was yet another reason that I made the decision to get up and get going. I was following the lake edge and had moved close enough to the tree line that my view of the moon had temporarily been blocked. As I kicked backwards I moved around a point and there before me was a sight that sort of like the Grand Canyon…you had to experience to actually get. The moon was now almost completely eclipsed and the portion that hadn’t yet been covered was truly blood red. It was both awe inspiring and a little bit unnerving. I grabbed my camera and took a few photos as well as a video of the lunar event that I was now a part of; unknowingly I had kicked so close to a beaver that when he decided to tail slap the water…it honestly took my breath away. I grabbed my GoPro and put it atop my stocking hat and started filming; moon, geese, beavers, casting, etc… My first bass was not a big one, maybe 12 inches, about the time I un-hooked and let him go I heard and saw what appeared to be a big fish feeding in the water just behind me. Through the years I have learned not to panic. These big bass aren’t going anywhere; they are cruising the water and searching for bait fish much like a Great White would in the ocean. I slowly rolled my float tube into position and made one accurate casts into the bubbles that were still on top of the water. I counted down a few seconds and started a slow, erratic retrieve…wondering would I get another good reason for my pre-daylight journey to this point? The next few minutes are exactly why I fish. Why I drive the miles. Why I put myself out there in the cold and dark. With my GoPro running I patiently got the fish to my reel and fought, a few inches at a time to get the big fish to the surface. 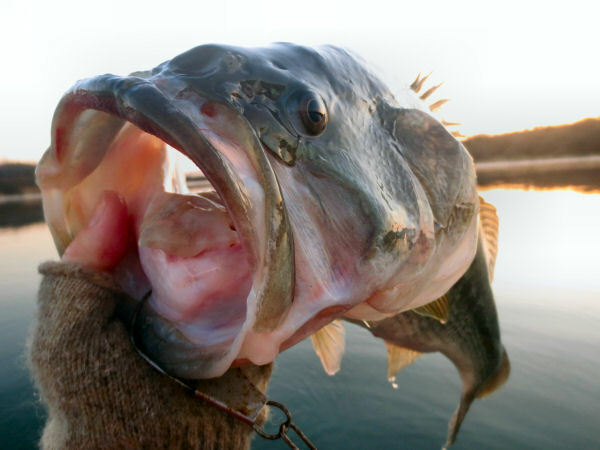 The water boiled, I peered and there before me was a big bass, I knew that I was connected to a keeper. A couple minutes later and I cautiously lipped a 20 inch, 6 ½ pound largemouth bass. My camera had caught it all and yes, it was indeed the reason getting up had been so worthwhile. I snapped a few photos, stowed away my camera then eased my GoPro off my head. With the bass in my right hand I held the GoPro under-water and filmed as this awesome fish eased its way down into the depths…it would make a nice signature scene on my video that you can see here. What a morning! I can honestly say that it was the most epic outdoor experience of my life. If I had missed this…well, I would have been very upset with myself. Nature was on full display this crisp, fall like day in early April and I had a front row seat for all of it. You can have the same ticket I have; just get up and get going…I will meet you as we all Enjoy the Great Outdoors.